Presented are two additonal White Background variations that to date, are still uncataloged and PSA has not recognized them. 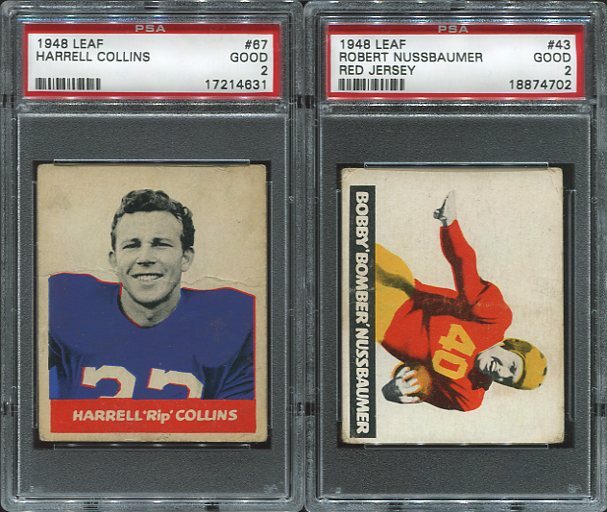 To the left is Harrell Collins, issued in the High Number Series and to the right is Bobby Nussbaumer, issued in the Low Number Series. After several attempts, PSA has finally recognized the Steve Van Buren Blue Sock variation. This variation exists in both the Green Jersey/Blue Sock (pictured below and previously uncataloged) and the Yellow Jersey/Blue Sock (cataloged in Beckett). PHILADELPHIA (AP) - Pete Pihos, a Hall of Fame receiver who helped the Philadelphia Eagles win two straight NFL championships in the 1940s, has died. He was 87. He died Tuesday at a nursing home in Winston-Salem, N.C., after a long battle with Alzheimer's disease, the team said. Pihos played with the Eagles from 1947-55. He was on the team that captured the title in 1948, and he made the winning catch in the 1949 championship game against the Rams. Pihos finished his nine-year career with 373 catches for 6,519 yards and 61 touchdowns. He was inducted into the Pro Football Hall of Fame in 1970. Pihos starred at Indiana before going on to the NFL. He was a stalwart on both sides of the ball at tight end and defensive end and missed just one game in nine NFL seasons. A six-time Pro Bowl selection, Pihos was nicknamed "The Golden Greek." He lacked blazing receiver speed, but relied on pirouettes and pivots to break free from would-be tacklers and was a punishing runner after the catch. "I try to get position on my opponent without him knowing it," the 6-foot-1, 210-pound Pihos told The Philadelphia Inquirer in 1955. "I always watch my opponent's feet. When he crosses them or makes a definite commitment, that's when I make my move. I'll do whatever maneuvering necessary to reach the spot where the pass is to come." Pihos still ranks among the team leaders in a number of offensive categories with the Eagles. He's third in catches behind Harold Carmichael and Pete Retzlaff; fourth in touchdowns after Carmichael, Steve Van Buren and Tommy McDonald; and 10th in all-time scoring with 378 points. He was selected to the franchise's 75th anniversary team. A fifth-round draft pick by the Eagles in 1945, Pihos didn't start his NFL career until 1947 because his college career was interrupted by World War II, when he served in the military under Gen. George Patton. Pihos' impact on the Eagles' offense and defense was immediate. 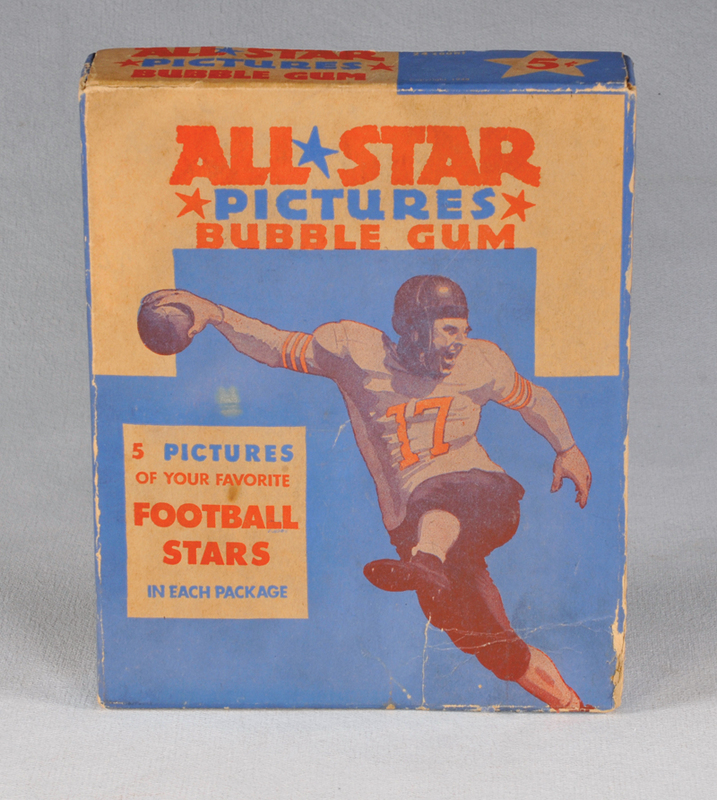 Philadelphia reached its first championship game in his rookie season, losing 28-21 to the Chicago Cardinals. The tandem of the sure-handed Pihos and Van Buren, a running back and fellow Hall of Famer, gave the Eagles a powerful offense, and Philadelphia claimed consecutive NFL championships in 1948 and '49. Philadelphia beat the Cardinals 7-0 in a blizzard in the `48 title game to claim its first NFL title. 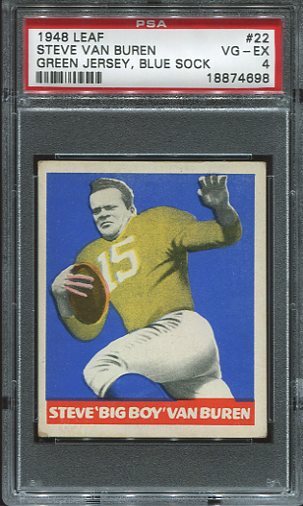 In the `49 title game, Pihos caught the eventual game-winning 31-yard touchdown pass from Tommy Thompson, and the Eagles beat the Los Angeles Rams 14-0 to become the first team to win back-to-back NFL championships in shutouts. Eagles coaches later decided to have Pihos concentrate on offense when the platoon system was instituted. But when the Eagles needed help on defense in the 1952 season, Pihos stepped in and was an All-Pro at defensive end. Pihos' last three NFL seasons were his most productive. In 1953, he had career highs in receptions (63) and yards (1,049) and scored 10 touchdowns. At Indiana, Pihos was a versatile star during the 1942, `43, `45 and `46 seasons. He led the Hoosiers in receiving in 1942 and `43 and in rushing in 1946. He is a member of the College Football Hall of Fame. As a member of the Army, Pihos served 14 months in Europe during World War II. He told the Pro Football Hall of Fame that he had vivid memories of serving under Patton, whom he called "a tough son-of-a-gun." A native of Orlando, Fla., Pihos is survived by his ex-wife, Donna Pihos, who has been his caretaker for the past 12 years; their daughter, Melissa Pihos; and children from a previous marriage: son Peter Pihos Jr., daughters Nikki Pihos Walker and Lisa-Anne Pihos Mann, and stepson John Wesley Poole.